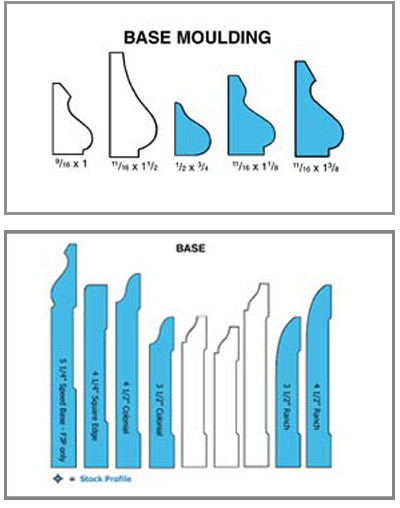 There are a few basic moulding types, each with their own uses and profiles. There really are not many rules about which moudlings you can mix and match, so feel free to use your imagination to create lots of combinations. BASEBOARD: Baseboard is a moulding that is rarely noticed, since it is usually found only along the border of the floor and the wall. It is also known as "mop board", since it is the moulding that is most often hit by the mop when cleaning the floor. This is a part of the reason why this moulding is there. It protects the bottom part of the wall from mops, shoes, and other abuses, keeping your walls from cracking. They are usually relatively simple looking, and often loosely match the style of the casing in a room. A "colonial" casing is most often seen with a colonial base, which is also often called "ogee base" or "O-G base". Ranch base, also known as clam base, is usually seen with its counterpart, the smooth ranch (or clam) casing. CASING: Casing is a moulding that is usually used to surround windows or doors, to give them a finished look. The styles of casings vary somewhat, to give a room a different feel. There are two sizes that are the most common. 2 1/2" wide is by far the most common, and 3 1/2" is also found fairly often. If you are replacing or matching moulding, check which you have. If you are adding new moudling, look at both first, to get a sense of how each looks. 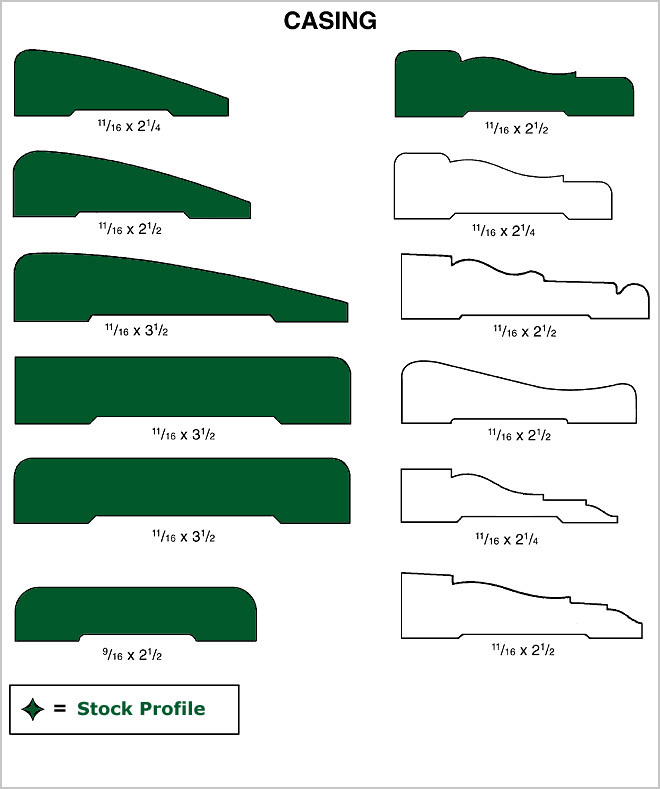 The two most popular styles are colonial casing (the top right profile) and clam casing (the top left profiles). Clam casing is also called ranch casing. 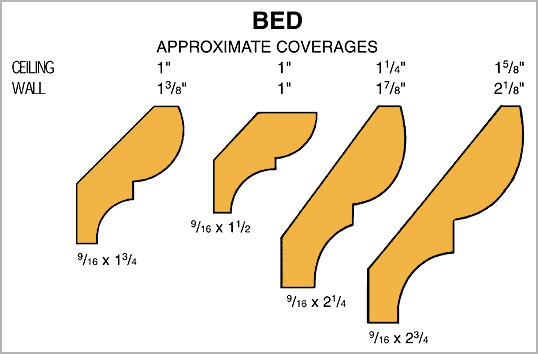 BED MOULD: Bed mouldings are an option to use when a vertical and horizontal surface come together at a corner, much like where a cove moulding, crown moulding, or cornice moulding are used. A bed tucks into the corner a little tighter than a crown moulding, but has a little more of a shadow line than the simpler cove. It can be combined with other mouldings to give your ceiling borders a very interesting look, or it could be used to dress up the edges of stairs or many other corners in your home. The profile is very similar to the cove moulding, though it does have an extra profile that gives it a very different look. It also fits into the corner in a different way, setting in at an angle, leaving a small space behind it. This helps make it useful in masking irregularities in the joint between the wall and ceiling. 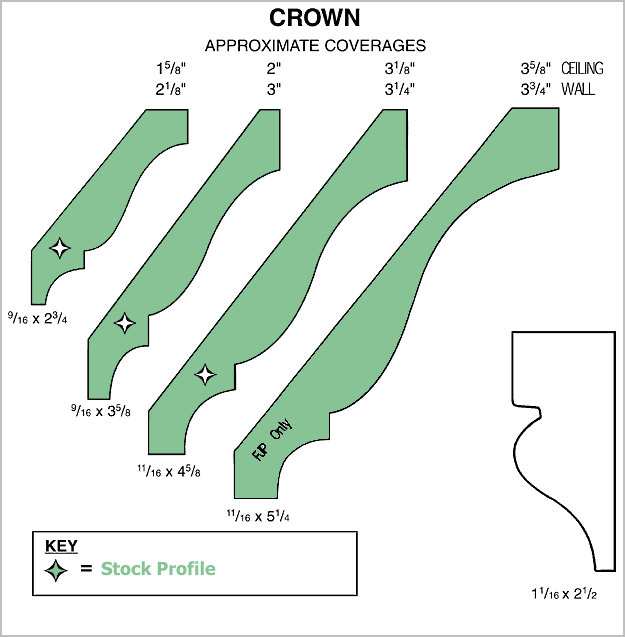 CROWN: Crown mouldings are designed to go into corners, to give a more interesting shadow line. This is similar to the cove mouldings, bed mouldings, and cornice moulding. The crown moulding is different, both in its profile and its size. Its profile may incorporate a cove, or it may only have gentle curves. Crown mouldings have been in use for an exceptionally long time. In some cases, their age is evident by their size and thickness. In a few rare cases, crown mouldings are difficult to match, due to its dimensions. STOOL CAP: Stool Cap is often called window sill, since it is what you see when you look at a window sill. It attaches to the subsill of the window, and both protects and dresses it up. 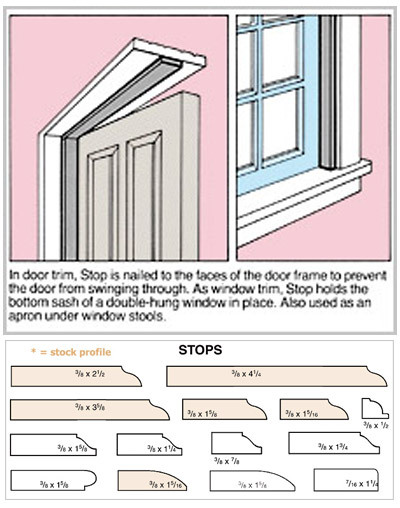 STOP MOULDING: Stop mouldings are used primarily on the inside of door and window jambs, so that the door will fit snugly into the jamb, without allowing light to pass through. It is often attached to a flat piece of jamb, so that there is no need to rout out a rabbet [i.e. a groove] to accept the door. 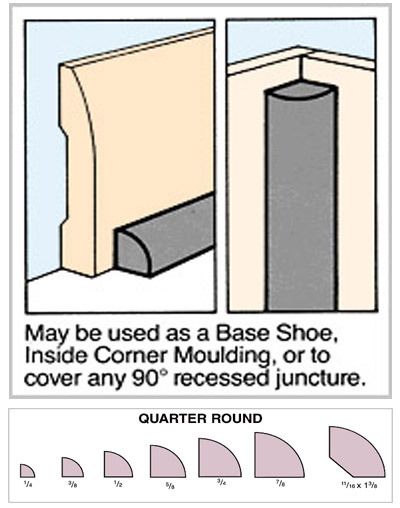 QUARTER ROUND MOULDING: Quarter round moulding is a good all purpose profile that can soften any 90 degree angle. It is often used along with a baseboard to help finish off the edges of wood floors, or to ease the edges for transitions between rooms. It is also useful to mask joints inside corners, giving a clean, finished look. 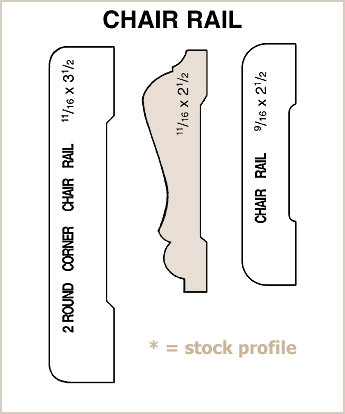 CHAIR RAIL: Chair rail is the moulding you see running around a room approximately 3 feet up the wall. This moulding was originally put in place to protect the walls from chair backs. The moulding kept the chairs from striking and cracking the plaster. Today, it serves a similar purpose, but has become more decorative than protective. 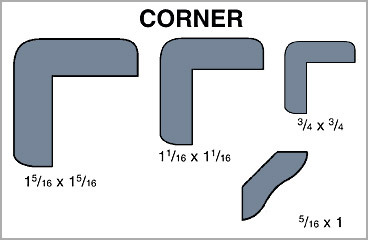 CORNER MOULDING: There are two basic sorts of corners mouldings: inside and outside. We stock a few sizes in the outside corner, and one size in the inside corner. 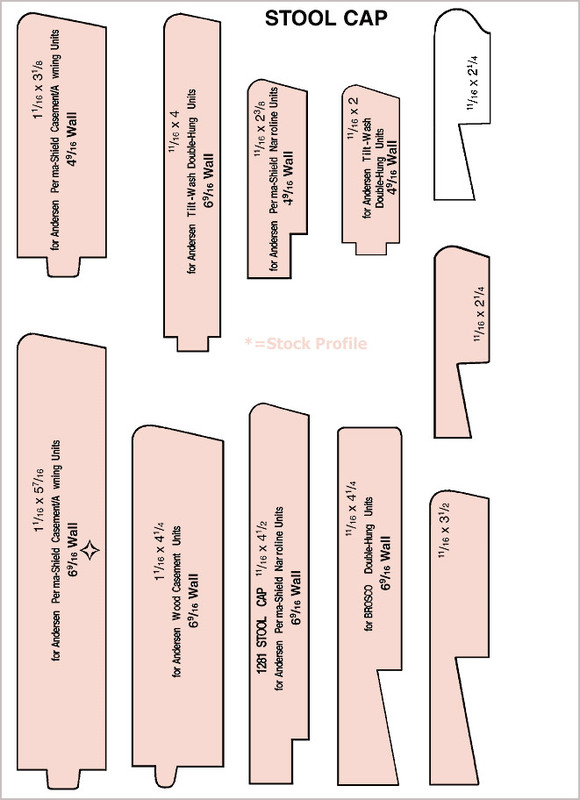 Some come as precut 8' pieces, but we do sell them by the foot as well. A corner moulding can be just the thing to dress up the corner of your wall, drawing the eye down the rich stained wood to the matching baseboard. It can also be a nice break in the lines and texture of the wall, allowing for a nice break between different wall colors or patterns. 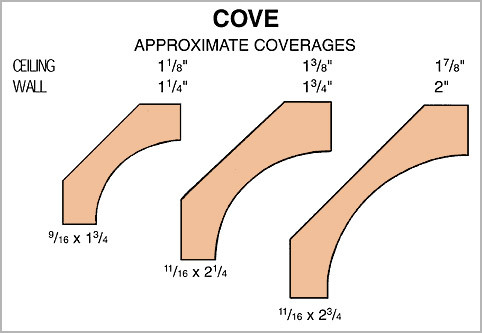 COVE/SCOTIA: Cove moulding, or "scotia", is a fairly simple yet elegant moulding that gives an inside corner an extra texture. It is essentially a scooped out corner that eases what can be a sharp transition between a wall and ceiling, or along the edge of a stair tread. It is often seen as a simpler version of some more ornate looking mouldings, like cornice, crown, or bed mouldings. BAND MOULDING: Band moulding has many uses. It will give an interesting edge to the top of a wall, or add shadow lines to a wood project. It can be attached to most anything which you feel needs a little dressing up. 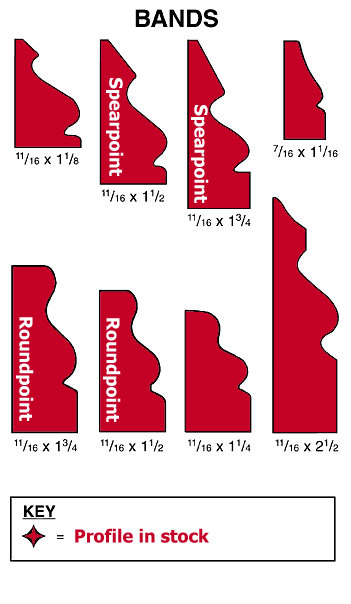 In some sizes there are two different profiles, known as "spearpoint" and "roundpoint". Spearpoint has an angular cut in its point, while the roundpoint has a softer, rounded look to it. 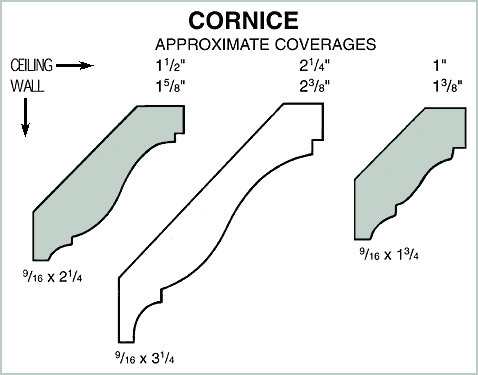 CORNICE: Cornce moulding serves a similar purpose in room design as crown, cove, and bed moulding. It fits into a corner and adds interesting shadow and sight lines into any 90 degree joint. HALF ROUND: Half round mouldings are used as a decorative border in all sorts of applications. They are often applied to an edge to ease the normally square edges without having to use a router. We stock the sizes in yellow.